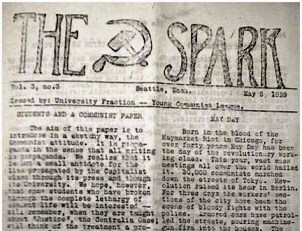 The party's District 12 office in Seattle encouraged several short-lived publications in the 1920s, including The Spark, a lively mimeographed newsletter published by the University of Washington chapter of the Young Communist League. 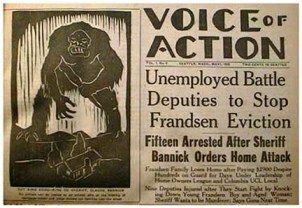 In 1933, shortly after Lowell Wakefield returned to Seattle in a party leadership rotation, the party began publishing the Voice of Action, with Wakefield serving as editor. The Voice of Action published weekly for three years and party members sold copies and circulated it in cities and towns of Washington and nearby states. Party ownership was not openly proclaimed until 1935, but the militant weekly was firmly controlled by the District 12 Executive committee. Well written, with loud headlines and eye-catching graphics, the weekly devoted much attention to the plight of unemployed workers in the Washington area, promoting the activities of the Communist controlled Unemployed Councils. Party efforts to organize unions, especially in the timber industry, were another focus. In 1936, the Party closed the Voice of Action in order not to compete with the Commonwealth News, a weekly published by the Washington Commonwealth Federation. The WCF had been created two years earlier by radicals who hoped to turn the Democratic Party to the left. Embracing a broad coalition of interests, the WCF nominated candidates for state and local offices and promoted ballot measures and other political initiatives. Many of its candidates were successful and at times the WCF exercised considerable influence in the state legislature and in Washington's Congressional delegation. 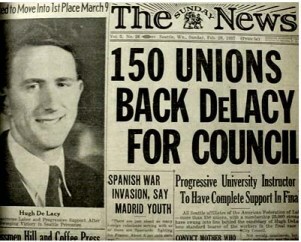 Fearing the disruptive tactics of Communists, the early WCF banned CP members, but after 1935 Communists became more and more influential in the organization as WCF leaders like Howard Costigan and Hugh DeLacy became party supporters or members. 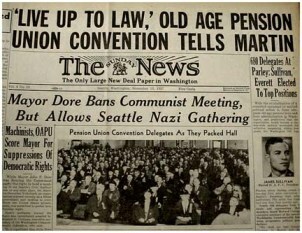 See our collection of digitized articles from the Washington Commonwealth Federation newspapers.